The reign of Qianlong witnessed a gradual lessening of formal elegance in the arts: the overall unity of many pieces was often overshadowed by accomplished technique. Decorations sought to imitate all kinds of materials jade, bronze and silk. 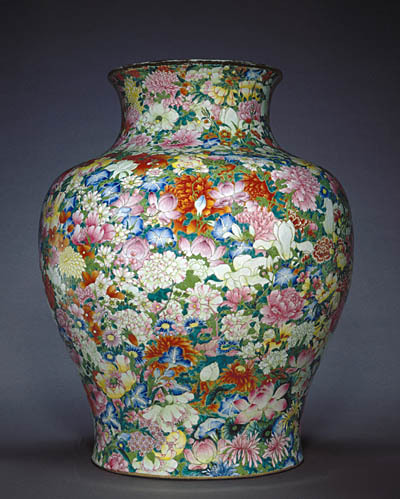 This “Thousand Flowers” vase, adorned with hundreds of intermingled chrysanthemums, peonies, lilies, morning glories, magnolias, roses and lotuses, resembles a sumptuous brocade. The decorative features, with their delicately shaded colours, not only derive from careful observation but also reveal an intense feeling for volume. The result is a work of unsurpassed accomplishment, in which the vivid enamels combine to create an ever-changing interplay of impressionistic force. On a technical level, the vase is a sheer tour de force. The Famille Rose palette characterized by a pigment derived from purple of Cassius, a gold-based colloidal chloride is used together with the yellow of iron antimoniate, the green of copper oxide, and an orange-coloured tone produced from iron oxide. These pigments were mixed in a lead-silica enamel that required a second firing in a muffle kiln at around 800-850o C.
Like an incredible fireworks display, this vase reflects the flamboyance of the Chinese potters? last creative period.